Njal’s saga is 159 chapters long. This synopsis lists the events of the first 80 chapters, up to and including Gunnar’s Last Stand, which forms a natural break half-way through the narrative. Chapters 1 introduces Mord Fiddle and his beautiful daughter Unn; and Hoskuld Dala-Kollson and his half-brother Hrut. In a brief vignette Hoskuld introduces his beautiful young daughter Hallgerd but Hrut takes against her. 2 – Hoskuld and Hrut attend the Althing where Hrut proposes to Mord that he marry Unn. A deal is done. But riding home his paternal uncle Ozur arrives from Norway to say a kinsman has died and Hrut needs to sail there to claim his inheritance. The marriage deal with Mord is renegotiated with a 3-year delay. 3 – Hrut and his uncle Ozur sail to Norway and go see King Harald Grey-Cloak (which dates these events to the 960s since HG-C reigned from 961-70). The king’s mother, Gunnhild, wife of the dead King Eirik Bloodaxe, seduces Hrut and makes him her man for as long as he stays at court. Hrut has Viking adventures sailing south in pursuit of Soti who has sold and stolen his inheritance, but he is caught and the money recovered. When Hrut finally returns to Iceland, Queen Gunnhild asks if he has a woman there and he lies and says no, and she casts a spell on him to make him impotent with her. 6-7 The marriage proceeds but is never consummated. Unn tells her father Mord Fiddle and he advises her to be patient but another winter of frustration passes and she meets her father again at the Althing and he advises her to pretend to be ill then to leave Hrut with her servants and goods. And this she does & returns to his house. Mord goes to the Law Rock and gives notice of Unn’s divorce from Hrut. 8 – Mord claims back his dowry of 90 hundreds, the full marriage settlement. Angry at this demand Hrut challenges Mord to a duel. Mord backs down to universal derision. 9 – Hallgerd Hoskuld’s-daughter has grown to be tall and beautiful and nicknamed ‘Long Legs’. A man called Thorvald discusses getting married with his father Osvif and visits Hoskuld who is keen to get shot of her. Hallgerd is cross at not being consulted. 10 – Hallgerd invites her foster-father Thjostolf and a famously bad-tempered man, Svan, skilled in magic. 11 – Hallgerd is a bad housewife and gets through all the supplies. When Thorvald berates her she says he and his father can go hungry. He slaps her and goes off to the Bjarn Islands to get supplies. Her foster-father Thjostolf comes by, sees she is hurt, and immediately rows out to the islands where he confronts Thorvald and kills him with his big axe, staves in the boats of his servants and rows back to land. 12 – Hallgerd advises Thjostolf to ride north to stay with Svan. When Osvif (her dead Thorvald’s father) rides north in pursuit, the wizard Svan creates a fog and then blackness which the posse can’t penetrate. they give up and ride over to poor Hoskuld’s who, on Hrut’s advice, gives Osvif generous compensation for his son. And Hallgerd stays with Hoskuld and asks if her foster-father, the murderer Thjostolf can come stay. 13-17 The brothers Thorarin Lawspeaker, Ragi and Glum enter the saga. Glum wants to marry Hallgerd. Hoskuld and Hrut are careful to consult her this time. She agrees and the contract is made. Things go well until foster-father Thjostolf is kicked out of Hoskuld’s house and goes live with Glum. They argue. Glum and Hallgerd argue and he slaps her. She begs Thjostulf not to take revenge; he only grins. They go round up sheep on a mountain and an argument sparks and Thjostulf kills Glum. Hallgerd advises him to ride to her uncle Hrut’s. He explains to Hrut what he did and Hrut immediately attacks and kills him. Thorarin and Ragi ride to Hoskuld’s and, although they are not liable and killed Thjostulf as soon as, Hoskuld behaves generously and gives the brothers compensation. They are now out of this saga. They only appeared for four chapters to amplify Hallgerd’s guilt and the Hs’ nobility. 18 Mord Fiddle dies. His daughter Unn inherits the estate and fritters it away. 19 – Introducing the hero of the saga, Gunnar Hámundarson from Hlidarend. Tall, powerful, skillful, athletic, generous, well-bred. 20 – Introducing the other hero, Njal from Bergthorsknoll. Wealthy and handsome and the most learned man in the law, he has one peculiarity: he cannot grow a beard. 21 – Penniless Unn goes to see her kinsman Gunnar, to ask if she will take up the case for reclaiming her dowry to Hrut. Gunnar vows to help her, gives her money, then goes to see his friend the superwise Njal. Njal has a plan. 22 – Njal maps out a complicated charade whereby Gunnar will pretend to be Hawker-Hedin who pretends to sell shoddy wares and argues and fights with everyone. He is to wend his away across south Iceland until he arrives at Hrutstead. There he is to let Hrut engage him in conversation and discuss the character of men from various regions until they come close to home, when Mord Fiddle’s name will come up. And Gunnar must let Hrut naturally raise the story of Mord’s failed attempt to recover the dowry. And Gunnar is to let Hrut go on to explain how Mord could have revived the claim at any point since, in fact anybody could who recited the correct form of words. And he is to get Hrut to tell him the correct form of words and repeat it once with lots of mistakes and let Hrut correct him, and read it a second time correctly – and he will have indeed have summonsed Hrut to the Althing. In the middle of the night he and his men are to make their getaway. 23 – Gunnar carries it off to the letter, then absconds. Hoskuld wakes from a prophetic dream and rushes over to his half brother’s house. But Gunnar has escaped. 24 – Gunnar presses his case at the Althing, Hoskuld and Hrut come back with counterarguments, at which point Gunnar simply challenges Hrut to single combat which, wisely, he refuses, and has to pay back the whole dowry, which Gunnar hands over to Unn. 28-32 Gunnar and his brother Kolskegg travel abroad in the ship of Halvard the White. They have two fights with Vikings. Gunnar stays with and impresses King Harald Gormsson/’Bluetooth’ of Denmark (958-986). Then sails north to Trondheim and impresses Earl Hakon (970-995). in the sea battle in 30 Gunnar wins the halberd he keeps for the rest of his life. 35 – The seeds of enmity between Hallgerd and Njal’s wife Bergthora when Thorhalla returns to Njal’s house and Bergthora asks Hallgerd to move along the dais to make room for her and Hallgerd rudely refuses. Hallgerd then insults Njal the beardless and Bergthora throws in her face the fact Hallgerd had her first husband killed. Hallgerd calls on Gunnar to revenge her but he refuses, saying he is too deep in debt to Njal.36 – Kol murders Svart Njal and Gunnar ride to the Althing. In his absence Hallgerd commissions a servant Kol to ride up to the woods and kill Bergthora’s servant Svart. 36 – Hallgerd sends word to Gunnar at the Althing, who takes it calmly and visits Njal. The friends agree a moderate payment of 12 ounces of silver for Svart. Back home at Hlidarend Gunnar reprimands Hallgerd. At Bergthorsknoll Bergthora takes on an itinerant named Atli who works with them through the winter. 37 – Atli murders Kol Bergthora commissions Atli to kill Kol and he does. It’s reported to Gunnr and Njal at the Althing. Njal gives back to Gunnar the pouch of silver he received as compensation for Svart. Gunnar and Njal reprove their wives. 38 – Brynjolf murders Atli Hallgerd orders Brynjolf to kill Atli up in the woods making charcoal. Gunnar pays Njal 100 ounces of silver. Hallgerd mocks him. 39 – Thord murders Brynjolf Thord tall handsome foster-father to Njal’s sons. Bergthora orders Thord to kill Brynjolf. 40 – Njal and Gunnar at the Althing are told. Njal pays Gunnar back the 100 oz of silver. 41 Introducing Gunnar’s kinsmen Sigmund Lambason and Skjold. Hallgerd organises Sigmund, Skjold and Thrain Sigfusson (he who married Hallgerd’s daughter in 34) to kill Thord. 42 – Sigmund and Skjold murder Thord. 43 – News brought to Njal and Gunnar at the Althing. Both shocked. Gunnar pays Njal 200 oz silver. 44 – Gunnar berates Sigmund, telling him to be careful. One day they are sitting round, Hallgerd insults Njal as beardless and the Njalssons as little dungheaps, and tells Sigmund to make a lampoon poem about them which he does. Gunnar overhears, is furious and bans the words. But some wandering beggarwomen hear them and go to Bergthorasknoll and tell Bergthora who tells Njal’s sons. Late that night Njal is woken by his sons packing their weapons and sneaking out. 45 – Skarp-Hedin, Helgi and Grim murder Sigmund and Skjold. Farmers tell Hallgerd. Gunnar refrains from demanding compensation until, at the next Althing, Njal offers Gunnar 200 oz silver. Both act with nobility and rstraint and vow to stay friends no matter what their wives do. End of the wives’ murders. 46 Introducing Gizur the White , a powerful chieftain, and his friend Geir the Priest. Mord Valgardsson, his mother Unn who we met in the opening pages of the saga now dead, is consumed with envy and hatred of Gunnar, the man who won Unn her dowry. 47 – Introducing Otkel Skarfsson of Kirkby, a kinsman of Gizur the White, his son Thorgeir, and his friend the scoundrel Skamkel. There is a famine. Gunnar lends food to kin and friends. He goes ot ask Otkel to lend him some form his store. Inspired by spiteful Skamkel Otkel refuses but, bizarrely, offers to sell him his good-for-nothing slave Melkolf. 48 – Hallgerd orders Melkolf back to Kirkby to steal food from Otkel then burn down his barn, which he does. On the way back his sandal strap breaks and he fixes it with a knife, leavin both knife and bits of strap by the way, which will become evidence. Gunnar arrives at Hlidarend with guests from the Althing. Hallgerd lays out provisions he knows they don’t have. They argue. Gunnar slaps Hallgerd. Bad idea. Remember Thorvald! 49 – Skamkell finds the incriminating knife. Wicked Mord devises a strategem for the women beggars to ascertain that Hallgerd has Otkel’s stolen food. They spread the word Hallgerd is a thief. Gunnar rides to Otkel and makes a fair offer of compensation – twice the value of the burned food. Egged on by Skamkel Otkel refuses, then sends Skamkel to get advice from his kinsman Gizur the White. 50 – Gizur and Geir advise Otkel accept the offer. Skamkel returns and lies, saying they advised summonsing Gunnar to the Althing. So Otkel rides over to Hlidarend with a posse and summonses Gunnar. 51 – At the Althing when Gizur and Geir hear Skamkel lied to Otkel they are livid. They go to Gunnar’s tent to make reparation. Gunnar is furious at being summonsed and judges the damages for the fire to exactly match his reparation for being summonsed ie totalling nothing. Gunnar wanrs Otkel to keep out of his way. 52 – Runolf stays with Otkel. He invites Otkel back. Otkel sets off with kin and two feisty horses. 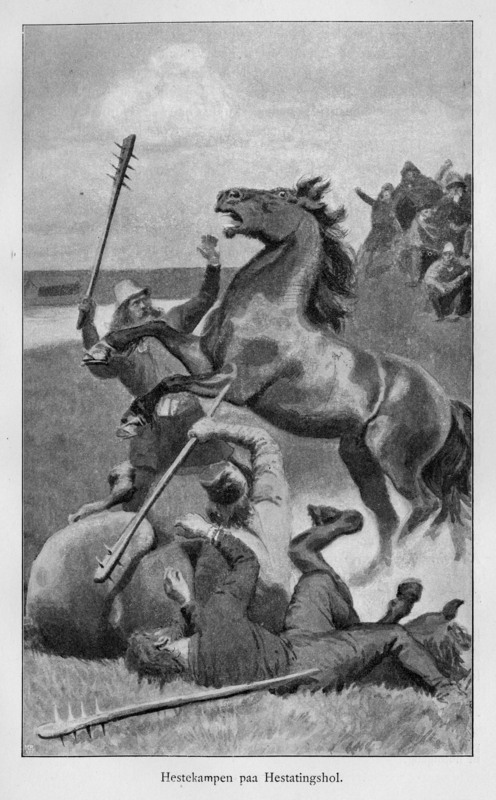 53 – Near Gunnar’s farm the horses run out of control and the one Otkel is riding crashes into Gunar out farming, Otkel’s spur gashing Gunnar’s ear. The rest of the entourage ride by jeering. They stay at Runolf’s a while, then plan to ride home to Kirkby. 54 – The Battle of Rang River Gunar, later joined by his brother Kolskegg, kill Skamkel, Audolf the Easterner, Otkel, Hallkel and four others. 55 – Njal advises Gunnar never to kill twice in the same family, and never to break a settlement among good men: it is a prophecy. Gizur the White activates the case against Gunnar. 56 – Aided by Njal Gunnar activates a suite of cases against the men who he murdered, and against their defenders at the Althing: mediation finds a settlement. Gunnar is held in high esteem. End of the Otkel episode. Gizur the White successfully calls for Gunnar to be delcared an outlaw. Anyone can kill him with impunity. Gizur assembles a posse of all Gunnar’s enemies, some thirty men in all, who make a compact to kill him. Njal offers to send his sons Skarp-Hedin and Hoskuld to go stay with him but Gunar nobly says he doesn’t want them to die for him. 76 – Mord Valgardsson tells the enemies Gunnar is alone at Hlidarend. Gizur the White and Geir and Starkad assemble and ride in a posse of 30 to Hlidarend. they threaten Gunnar’s neighbour into luring away his dog, Sam, then kill him, Sam’s death howl alerts Gunnar to the attack. 77 – Gunnar Hamunson’s Last Stand Surrounded and alone, Gunnar keeps his enemies at bay for a long time, killing two and inflicting wounds but finally they kill him. He had asked Hallgerd for strands from her hair to repair his bow but she refuses. Gizur the White asks Rannveig (G’s mother) for permission to bury their dead. 78 – In the aftermath Rannveig treats Hallgerd so harshly she leaves home along with the Gunnar’s bad son Grani. Gunnar is buried in a mound. A passing farmer and servant hear Gunnar chanting verse. On another occasion Gunnar’s good son Hogni and Njal’s son Skarp-Hedin see the mound open, illuminated with four lights and Gunnar chants a verse. 79 – Skarp-Hedin and Hogni set out with Gunnar’s halberd, ride to Oddi where they kill Tjorvi and Hroald. Ride to Thrihyrning and kill Starkad and Thorgeir Starkadson. Ride to Hof where Mord begs for mercy and, foolishly, they let him live. 80 – At the district Assembly Njal negotiates a settlement with the enemies. Geir the Priest is now out of this saga, as is Hogni Gunnarsson. Supernatural signs and omens occur throughout the text and are treated quite casually by the characters, although everything is treated casually, with little or no ‘affect’. 12 – Svan the magician creates fog then blackness to deter the posse pursuing Thjostolf. 41 – Thord sees a goat drenched in blood. It is his fetch. He is doomed. The more sagas I read, the more I appreciate how the stories and characters overlap and intertwine and begin to understand how the size and complexity of the 40 or so surviving sagas, taken together, create an enormous intertwining jungle of people and adventures. Working in different registers and chronicling different events, many of them nonetheless overlap dates and locations and sometimes characters, to create a vast tapestry. If you throw in the differences between the factual family sagas and the more legendary and mythical ones; if you throw in the general difficulty of getting clarity about even ell-known historical figures and events; and if you throw in the mystique and romance of learning an ancient and evocative medieval language – then you have the ingredients for an endlessly ramifying, wonderfully rich and rewarding field of study. I can see why people become addicted. Overlapping figures include Queen Gunnhild: as wife of King Eirik Bloodaxe she incurs the enmity of Egil Skallagrimsson who memorably sets up a scorn pole against them both. In Njals’ saga Eirik is dead (d.954) and Gunnhild is mother of King Harald Grey-Cloak. She plays the baleful role of putting a hex on Hrut which makes him impotent with Unn which leads to her divorcing him which leads to Gunnar taking up Unn’s case at the Althing.